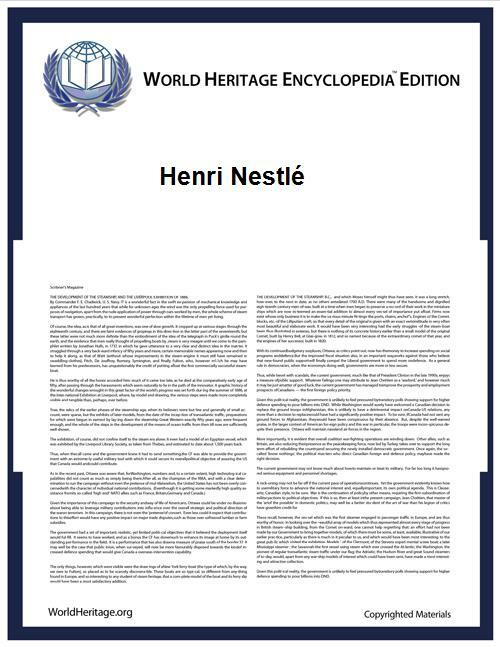 Henri Nestlé, born Heinrich Nestle (10 August 1814 – 7 July 1890), was a Swiss confectioner and the founder of Nestlé, the world's largest food and beverage company, as well as one of the main creators of condensed milk. Heinrich Nestle was born on 10 August 1814, in Frankfurt am Main, Germany. He was the eleventh of fourteen children of Johann Ulrich Matthias Nestle and Anna-Maria Catharina Ehemant. Nestle's father, by tradition, inherited the business of his father, Johann Ulrich Nestle, and became a glazier in Töngesgasse. The later Lord Mayor of Frankfurt am Main, Gustav Edmund Nestle, was his brother. The Nestle family has its origin in southern Swabia, predominantly in the boroughs of the Black Forest as Dornstetten, Freudenstadt, Mindersbach, Nagold and Sulz am Neckar. In the Swabian dialect, "Nestle" is a small bird's nest. The name Nestle also has different variations, including Nästlin, Nästlen, Nestlin, Nestlen, and Niestle. The Nestle family tree began with three brothers (thus the three young birds in the nest being fed by their mother on the family coat of arms) from Mindersbach called Hans, Heinrich and Samuel Nestlin. The father of these three sons was born circa 1495. Hans, the eldest, was born in 1520 and had a son with the same name, who later became mayor of Nagold. His son Ulrich was a barber and his fifth son was the first glazier in the family. For over five generations, this profession was passed down from father to son. Additionally, the Nestles provided a number of mayors for the boroughs of Dornstetten, Freudenstadt, Nagold and Sulz on Neckar. Before Nestlé turned 22 in 1836, he had completed a four-year apprenticeship with J. E. Stein, an owner of a pharmacy. At the end of 1839, he was officially authorized in Lausanne, Switzerland to perform chemical experiments, make up prescriptions, and sell medicines. Although the exact date is unknown, at some stage between 1834 and 1839 he had migrated for reasons unknown to Switzerland. During this time, he changed his name to Henri Nestlé in order to adapt better to the new social conditions in French-speaking Vevey, Switzerland where he eventually settled. In 1843, Henri Nestlé bought into one of the region's most progressive and versatile industries at that time, the production of rapeseeds. He also became involved in the production of nut oils (used to fuel oil lamps), liqueurs, rum, absinthe and vinegar. He also began manufacturing and selling carbonated mineral water and lemonade, although during the crisis years from 1845 to 1847 Nestlé gave up mineral water production. In 1857 he began concentrating on gas lighting and fertilizers. It is not known when Nestlé started working on the infant formula project, although by 1867 Nestlé was able to produce a viable powdered milk product. His interest is known to have been spurred by several factors. Although Nestlé and his wife were childless, they were aware of the high death rate amongst infants, and Nestlé would have been aware of Justus von Liebig's work in developing an infant formula. In addition, fresh milk was not always available in large towns, and women in higher society were starting to view breast feeding as an "unfashionable" option. Nestlé combined cow’s milk with grain and sugar to produce a substitute for breast milk. Moreover, he and his friend Jean Balthasar Schnetzler, a scientist in human nutrition, removed the acid and the starch in wheat flour because they were difficult for babies to digest. Initially called "kindermehl", (children flour), his product had an advantage over Liebig's "Soup for infants" in that it was much easier to prepare, only needing to be boiled prior to feeding, and it soon proved to be a viable option for infants who were unable to breast feed. People quickly recognized the value of the new product and soon, Farine Lactée Henri Nestlé (Henri Nestlé's Milk Flour in French) was being sold in much of Europe. By the 1870s, Nestlé's Infant Food, made with malt, cow's milk, sugar, and wheat flour, was selling in the US, for $0.50 a bottle. Henri Nestlé and Anna Clémentine Thérèse Ehemant were married on 23 May 1860. Henri Nestlé sold his company in 1875 to his business associates and then lived with his family alternately in Montreux and Glion, where they helped people with small loans and publicly contributed towards improving the local infrastructure. In Glion he moved into a house later known as Villa Nestlé. Nestlé died of a heart attack in Glion on 7 July 1890. he was buried at Territet Cemetery in Montreux.